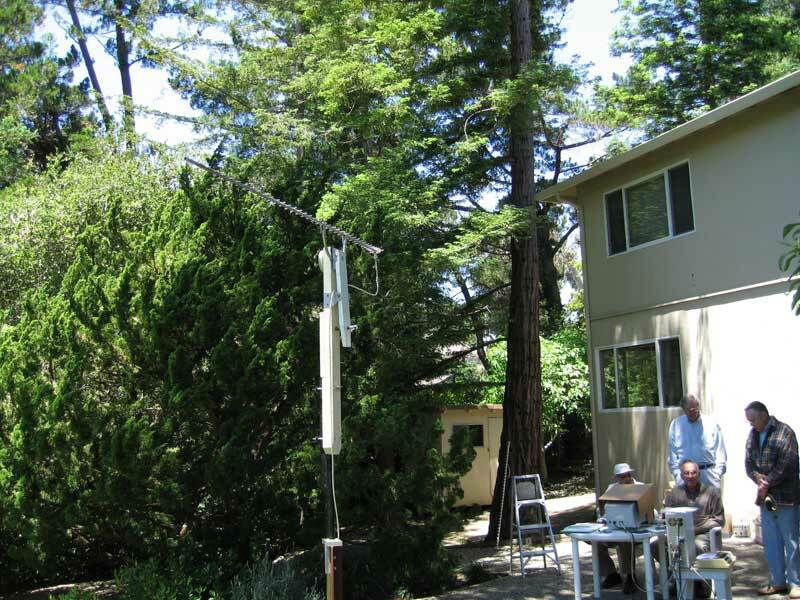 This is the extent of the real estate devoted to the "antenna range", and is the back yard of Bob Melvin (W6VSV). Bob spent some 10 years after his retirement working on the mechanical and electronic aspects of the range. 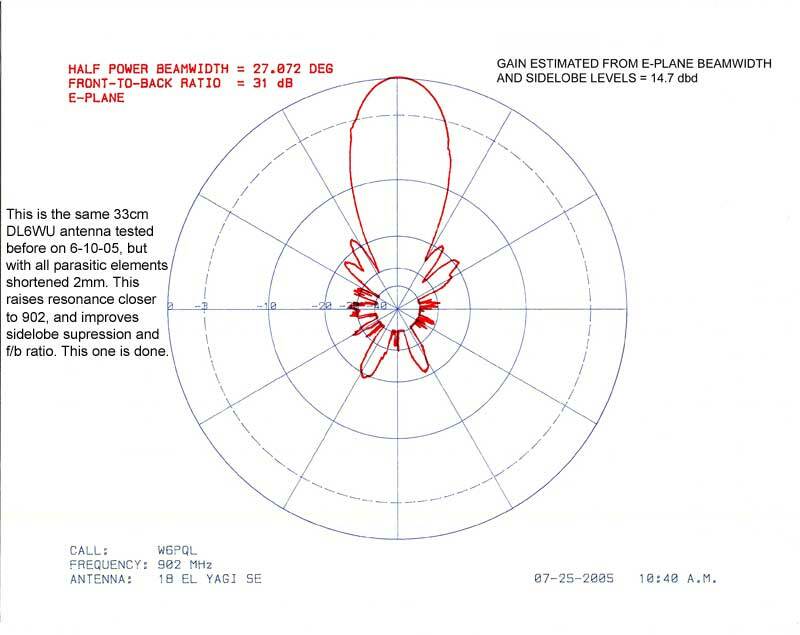 The basics are that a source antenna is located at the far end. 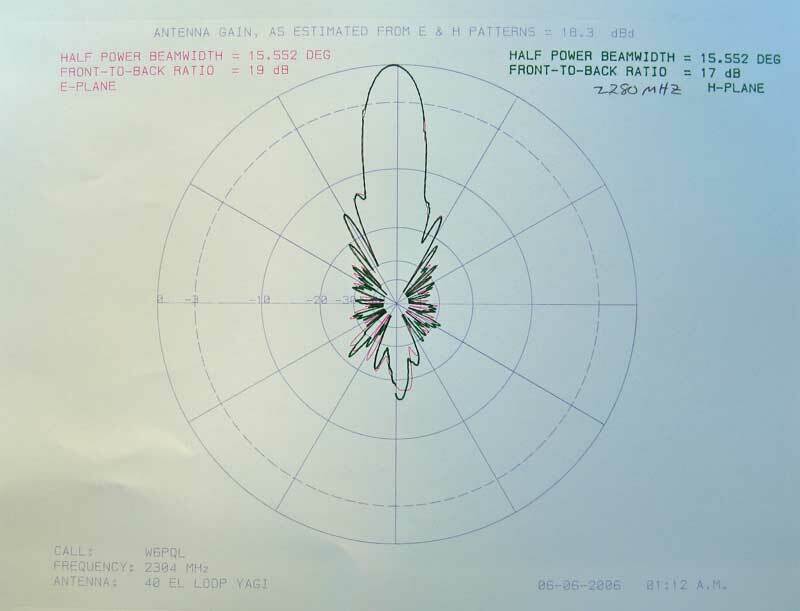 A signal source is connected to this antenna, and is square-wave modulated at 1KHz. 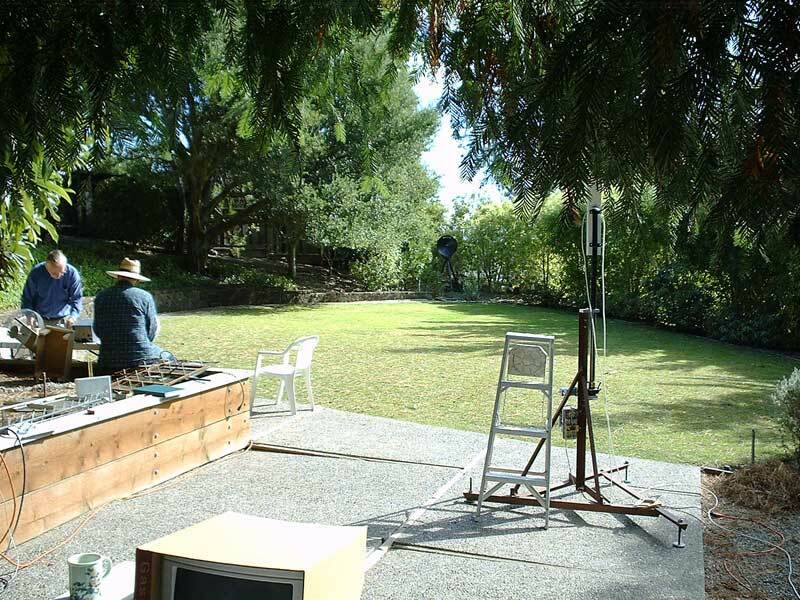 The antenna under test is on the test stand in the foreground, with a microwave crystal detector connected to it. 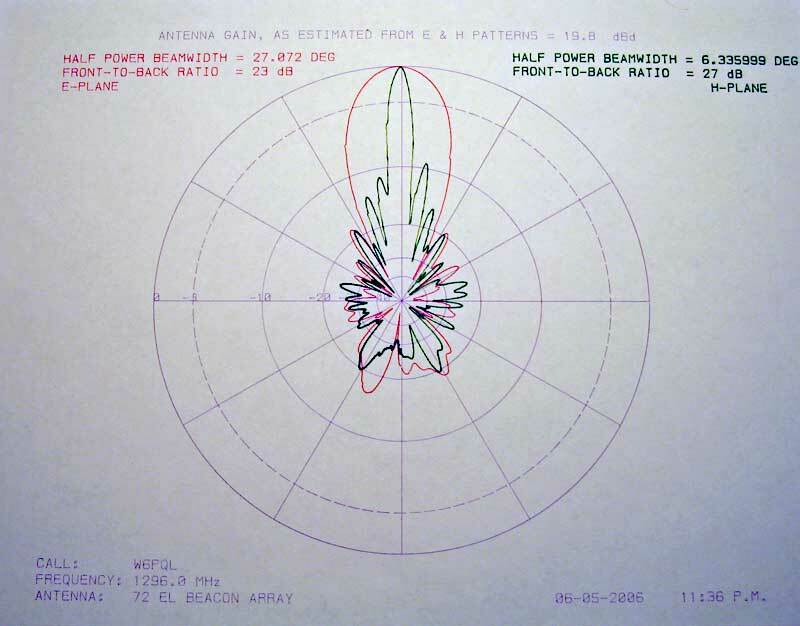 This detector is connected to the equipment set, consisting of amplifiers, curve shapers, attenuators and filters, and is all under computer control. The antenna under test is rotated 360 deg under this control via a stepper motor, and the signal level is measured at 500+ points along the way. 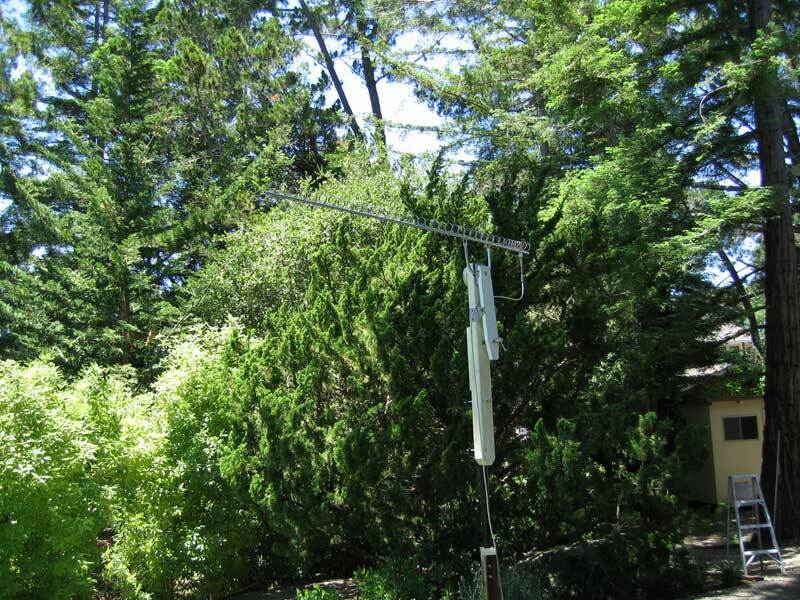 Bob gets about 50 db of dynamic range, better than 1 deg accuracy in azimuth, and is able to measure both E and H plane performance by twisting the source and test antennas 90 degrees between successive plots. 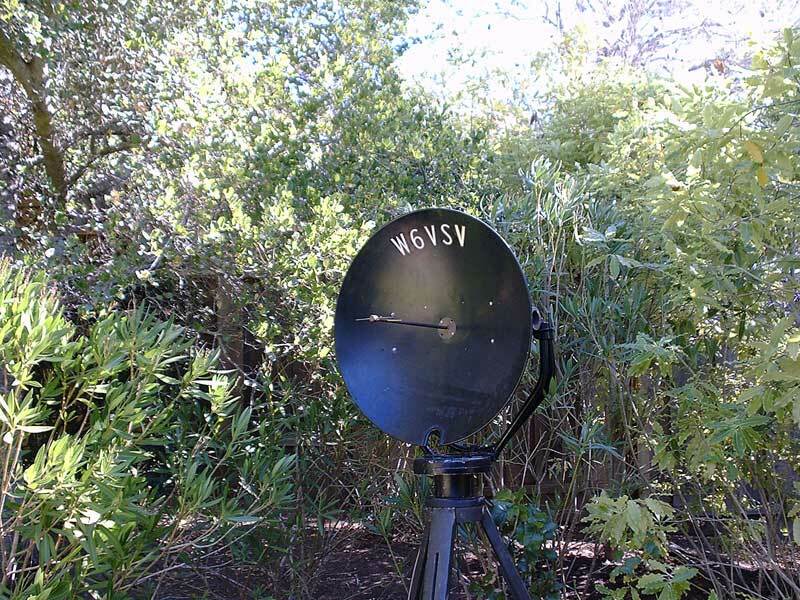 This is a close-up of the source antenna used on 23cm. 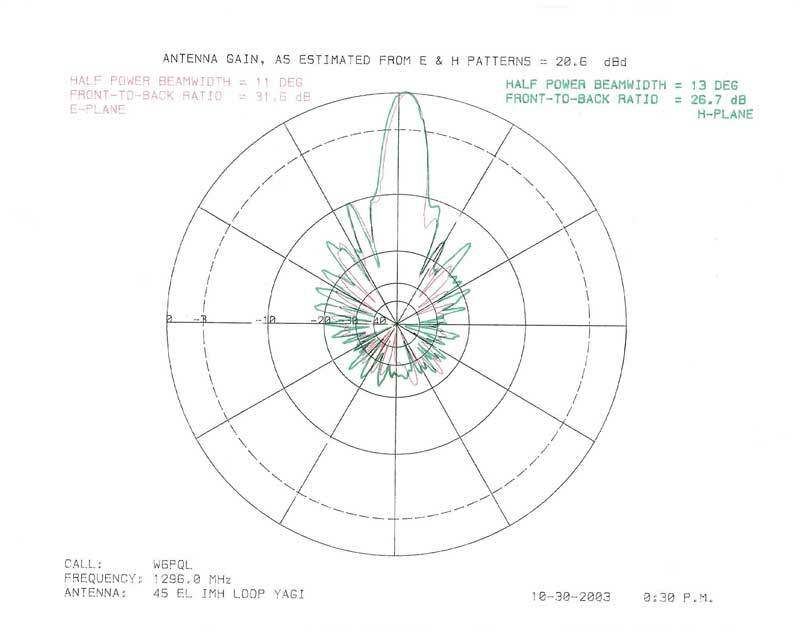 This is a polar plot of one of the first antennas we tested, a 23cm loop Yagi from the International Microwave Handbook. 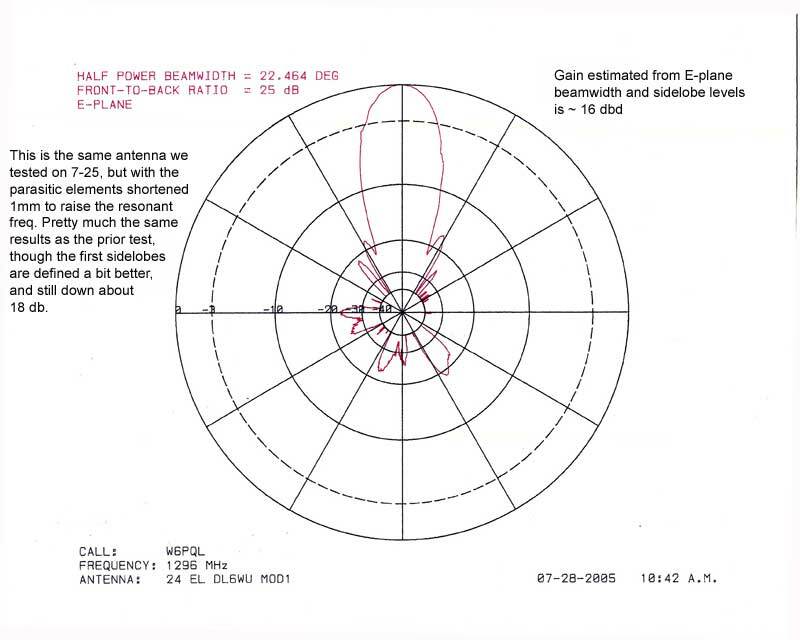 This next one is a rectilinear plot of a 25-element 23cm loop Yagi built from the ARRL handbook. 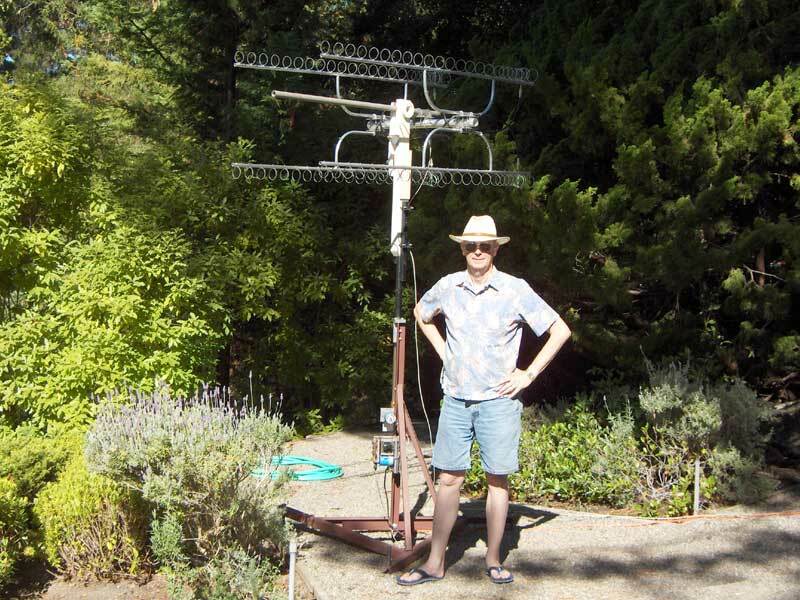 Here's a snapshot of myself and a 100 element loop Yagi array I built and used for about a year. The pipe in the center was used as a counter-balance for the test stand. 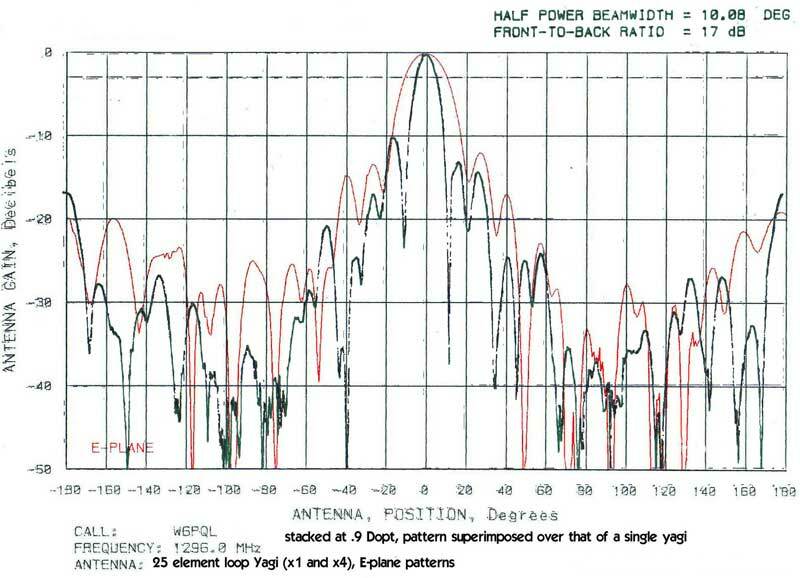 These antennas are currently in use with K6TSK in Anaheim. Here's a plot of the 100 element array. OK, I'll fast-forward to 2005, where I started using the VK5DJ calculator for the DL6WU designs. 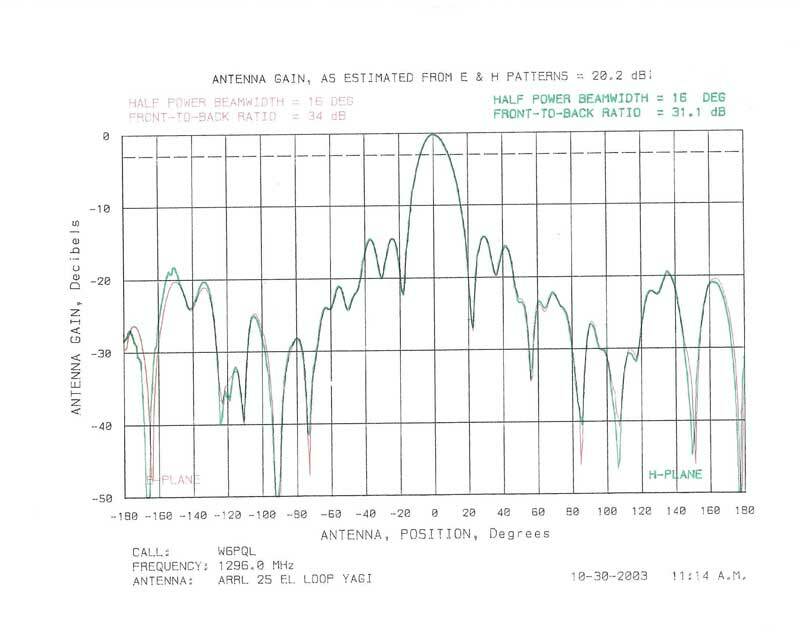 I noticed that the antennas, although very close to calculator specs, tended to be resonant a bit lower than the calculator suggests it should. This tends to become more exaggerated as one goes up in frequency, and may relate to how much of a wavelength the boom itself represents (as a % of full wave)? 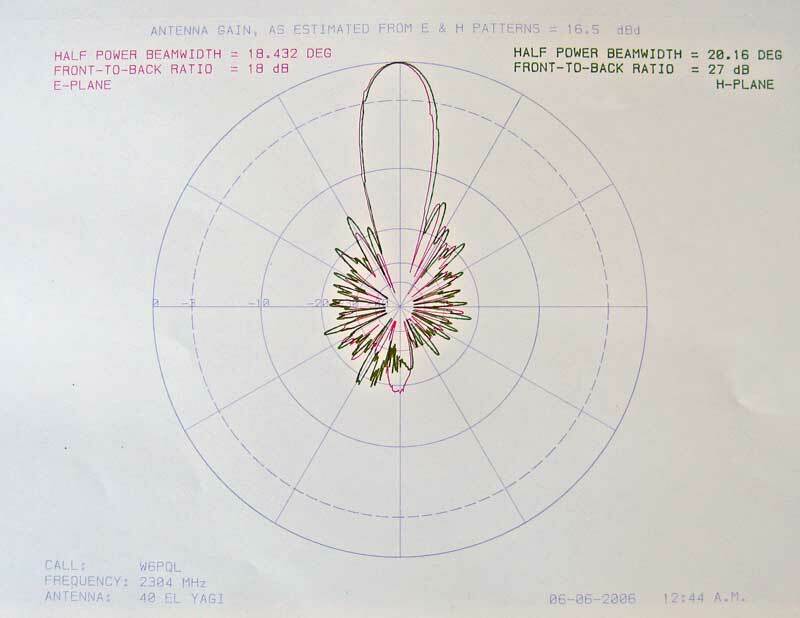 This next one is a 72-element 23cm array I built for a beacon, and the polar plot follows in the next shot. 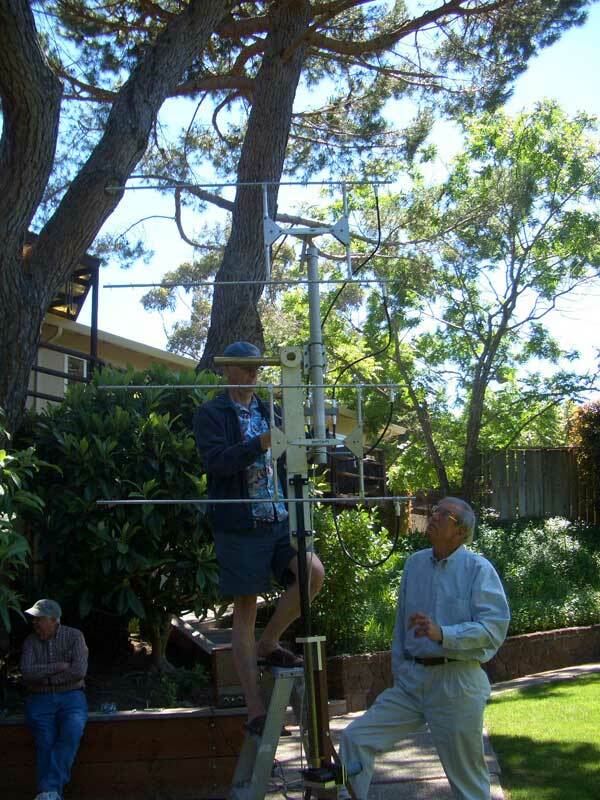 Pat (WA6UAP) is the fellow on the right, and is assisting with the set-up. Fairly high H-plane grating lobes, but not a problem for this application. This 30w beacon and antenna array is located 2 miles away from my QTH at sea level, and is heard all the way into Mexico on 23cm.